Air King created this blower especially for those who need an air circulating fan that has a large output but uses minimal electricity. This model comes with a GFCI plug that enables its usage in damp or wet areas. It is perfect for use in basements or crawl spaces. Just like our pivoting 3-speed blower, you can plug in multiple units and run them together. With the Air King pulling approximately .9 amps, you can safely plug up to 15 fans into 1 outlet and blow air over a large area. 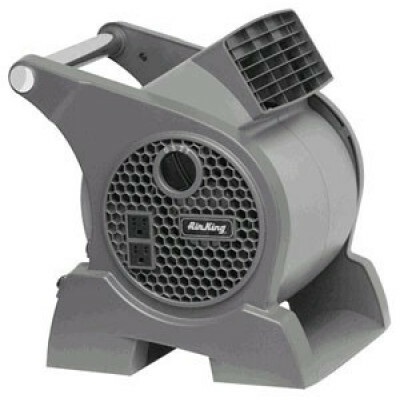 For a complete selection of powerful fans, see our full carpet blowers and dryers category. Two 120-volt grounded outlets for running multiple units on the same electrical outlet. 7-foot cord with GFCI (ground fault circuit interrupter) plug that allows for safe usage in damp or wet areas. Fully assembled for immediate use out of the box. Low amp draw enables connections up to 15 fans in a series - one fan for every 10 feet! ETL safety rated and OSHA approved. Customers who were interested in the Crawl Space Air Circulating Fan were also interested in the following items. This is a review for the Crawl Space Air Circulating Fan.